The Friends of Lismore Rainforest Botanic Gardens (FLRBG) have been the driving force behind the establishment of the gardens since 2000. 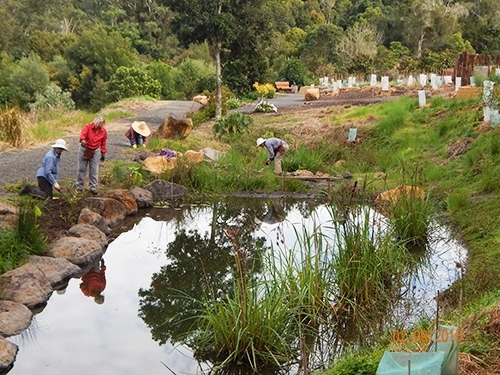 This passionate group has transformed over four hectares of degraded bushland on the northern side of the Lismore Recycling & Recovery Centre into a beautiful rainforest botanic garden, working in partnership with Lismore City Council. Anybody with an interest in plants and the environment is welcome to join the enthusiastic and energetic Friends of Lismore Rainforest Botanic Gardens. While people who love to plant and maintain trees are always needed, the group needs others who are willing to take on the myriad other activities that are part of a functioning botanic garden. Whatever the task, being part of the Friends is a very rewarding experience. Volunteer work mornings are held every Wednesday from 8am till 11am at the gardens as well as the last Sunday of every month starting at 8am in winter and 7.30am in summer. Wear covered clothing and shoes, bring insect repellent, sunscreen and bring something for morning tea. Just turn up or contact the Friends on friendslrbg@bigpond.com. For more information visit www.friendslrbg.com.au. The newsletter of the Friends of Lismore Rainforest Botanic Gardens is published biannually in February and August. It is an interesting and informative publication with stories about the plants and activities of the Friends. It also features a broader range of topics relating to rainforest plants, animals and the environment. To view past copies visit the Friends of the Lismore Rainforest Botanic Gardens website.